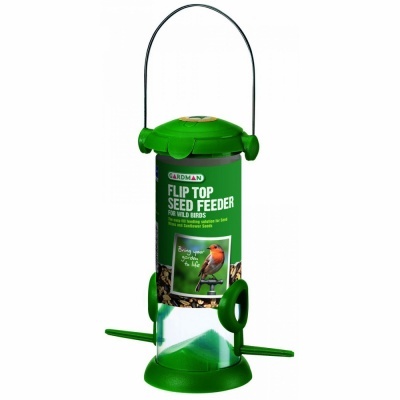 Gardman Filled Flip Top Seed Mix Feeder - No Grow Mix for Wild Birds provides a no mess durable plastic seed bird feeder, pre-filled with Gardman No Grow Bird Seed Mix. A premium blend with oil rich, high energy sunflower hearts, peanut bites and suet treats. No Grow Mix is a gardeners choice as fallen seeds or seed husks will not germinate, when dropped by birds beneath the feeder. Easy flip top lid for single handed no mess easy refill.